Having worn glasses since she was three, Charlotte P. ’29 discovered she had a drawer full of glasses that were either too small or the wrong prescription. Not wanting to let them go to waste, she and her family began to investigate how they could give their old glasses new life. Their research led them to the Lions Club of New York which sends used glasses to volunteers who measure their prescription strength, refurbish the lenses and frames, and make the glasses available to local low-income communities. Charlotte also noticed that many people have the same problem she had, so she began an eyeglass recycling drive at Marymount. 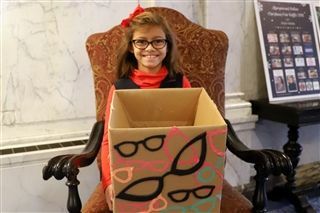 “I want to encourage everyone to clean out their drawers and donate their old glasses – the upcoming Thanksgiving and Christmas breaks are a perfect time to collect used glasses from family, friends, and neighbors,” Charlotte says. “I’m hoping to collect 600 pairs of glasses by the end of the school year.” There are collection boxes in the 1026 and 82nd Street lobbies. To date, 154 pairs of glasses have been collected, and donations are accepted through June.